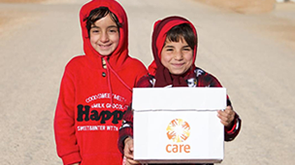 CARE started working in Bosnia and Herzegovina in 1993, providing humanitarian support to people affected by war. Since the end of the war, the population has remained vulnerable to poverty, gender-based violence and discrimination. There are deep community divides. Our programmes focus on economic activities, peace and reconciliation, integrating minorities and creating opportunities for young people. We work with vulnerable and marginalised groups – women and girls, poor farmers, Roma communities and others – to build sustainable peace and promote social, economic and political rights for all. By building capacity of local organisations and networks CARE assists governments to suppress trafficking in the region and help victims to integrate into society. We focus our work in border communities where women are most vulnerable. We aim to raise awareness on trafficking issues through information campaigns and workshops.